Whenever two or more parties are convinced that they're on the side of absolute right holy wars pop up. I'm not just talking about the religious conflicts that we see every day, but also professional debates that are verging on religion. Windows versus Linux versus Mac OS X. Emacs versus Vi versus Pico. Sendmail versus just about any decent email server. Japanese cars versus American cars versus European cars. Ketchup-on-your-steak versus Ketchup-lovers-should-die. Whatever, there's too much to even think of! The field of education unfortunately is no different. Many people think that they know what's best for today's kids and thus philosophies about teaching vary greatly! For example, in December I wrote about the Het nieuwe leren versus Het oude leren crowds. The first think that the folks over at BON are decrepit relics from a time better forgotten. The latter think that the HNL crowd are nonsensical managers lusting for new and shiny toys. And neither side is willing to give in one inch, or to even concede that the other side has at least -some- merit. One of the stories that's been recently snapped up by the BON-folks, is the story of Jan Verhoeven's family and their experiences with De Nieuwste School in Tilburg (The Newest School). While the Verhoevens are actually quite content in their role as chroniclers, the two battling sides grasp any chance to duke it out. The BON-ers ragged on the school on their fora, in their usual fashion. At the same time the DNS-folks grasp at any chance to portray themselves in an overly positive fashion, by grabbing media attention and by spawn camping the relevant Wikipedia pages. So instead of working on a real solution, both sides are just too fscking concerned with their little battles. Until recently I used to hate networking, the perceived obligation to talk business with people whom I had no interest in. Over the past year or so a realisation has been growing in me though: networking is something that happens automatically, to a certain degree. And you can make the parts that need to happen consciously as fun as they need to be. Example 1: Like many young folks in IT I hated the idea of networking and actually tried to avoid it. I reckoned that I had no network whatsoever and didn't care about it that much either. However, after eight years of working in IT I realised that I -do- have a network and that it's rather expansive! My friend/colleague Deborah recently nudged me to get onto Linked In and I managed to map out a large part of my network with minor effort. That's 150 names right there, that I can tap into if I ever need help with my job, a technical question, or whatever. In case you're curious, here's my profile. Example 2: Sometimes you stumble upon stuff that peaks your interest. Case in point, I recently poked around in and wrote a review about Ephorus. The product is Europe's leading anti-plagiarism software and both the teacher and the sysadmin in me got curious as to its workings. I managed to get my hands on a trial account (not normally given to students) and tried it out. I liked it well enough. Then a few days later followed an e-mail from their directory, asking if I'd like to come in for a talk. We had a great chat this morning, about Ephorus, about my work, about their work and just stuff in general. I had a great time and I even got a few -very- helpful suggestions that could help my career in the near future. This semester I'm taking the second year's course Geschiedenis 2 Vakgedeelte, which can be translated as History of math 2. Over the next two months we'll be taking a look at math through the ages, starting with the Egyptians and Babylonians. As part of this course, each student is expected to write a short biography on one of the Great Mathematicians (tm). I was assigned Euclid (Euclides in dutch), which seems to be a very interesting topic. So far I've done some six hours of research and I've gotten a pretty good picture so far. For instance, there's Rare Book Room.org. This website has gathered thousands and thousands of photographs of antique books. They've created a huge archive, so that mere mortals such as you and I can leaf through tomes that are normally in musea. 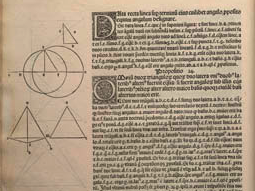 A 1482 print of Elements, by Euclid. A 1613 print of Istoria e Dimostrazioni Intorno Alle Macchie Solar, by Galileo Galilei. Another neat project is Euclid's elements of geometry by Richard Fitzpatrick. Mr Fitzpatrick has taken the 1883 Heiberg translation and used it to make a completely fresh english translation of Elements (Euclid's most famous work). You can download the book for free as a .PDF at the link provided, or you can fork over $28 to buy the hardcover print from Lulu.com. I'd say the print is definitely worth it! I've just ordered my copy, to support Mr Fitzpatrick's work. As I wrote in one of the comments I got a 90% for our project about students with learning and personality disorders. That was awesome. Analysis 1 - Didactics (about the teaching of basic math) consisted of ten separate reports. They came back as five 90%'s, three 80%'s and two 70%'s. Last monday my project team had its appointment for our oral defense of our essays. This was the first time we've had to do such a thing, since most docent's are happy just reading through our papers. In this case however, the teacher wanted to prod our minds a little about some additional questions. 1. How would you go about planning a big workload for a depressed child, say for example his final exams? 2. What needs to be done if a depressed child becomes the victim of harassment by his peers? Our defense went very well, with each of us answering all the questions to the teach's satisfaction. We actually had a good time and there was no stress at all :) In the end we were told that we could count on a 90%, assuming he didn't find any flaws in our final process reports. Nice!